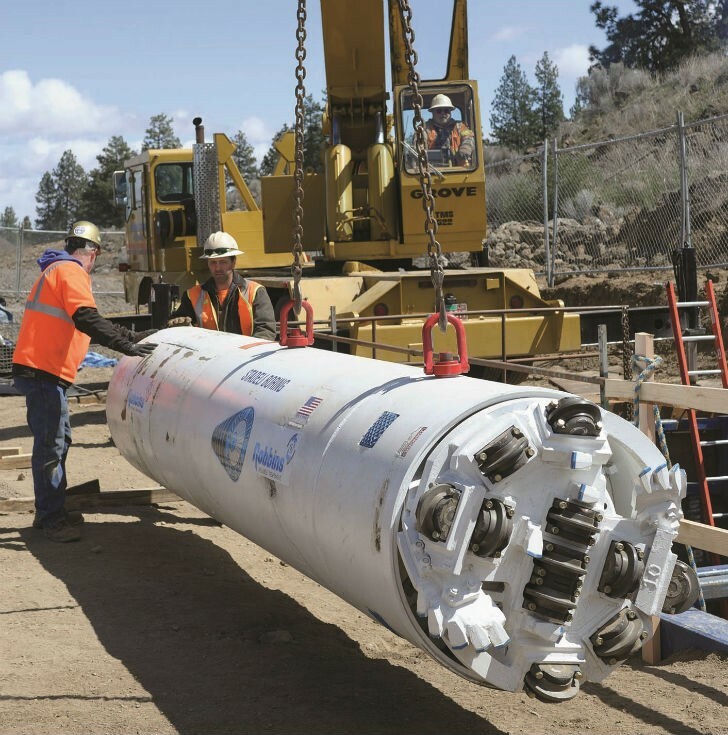 A prototype of the SBU-RC unit was tested at Bend, Oregon, where a general contractor needed to install 98 metres of 900-mm steel casing under railroad tracks, with close tolerances and in solid rock. Fortunately, there was a solution available to help them. The contractor turned to The Robbins Company, a business that they had worked with many times over the years for their Small Boring Units (SBUs). Stadeli first contacted Robbins 10 years ago to rent a 30-inch standard Small Boring Unit (SBU-A), and has since rented dozens more. The company currently owns two SBU-As, but their Bend, Oregon job required precision guidance systems that their SBU-As lacked. “We met with Robbins in Ohio and told them what our needs were. They felt like their 36-inch (900 mm) prototype machine, which they had tested at one other job in Oman, would be a good fit. They listened to what we were wanting and needing to have done,” said Stadeli. At Robbins, Kenny Clever, SBU sales manager, and a group of engineers were honing the prototype machine that fit the bill. Known as the SBU-RC, for Remote Controlled Small Boring Unit, the machine was equipped with a smart guidance system by TACS. The guidance system could show an operator projections of the future bore path so steering corrections could be made before the machine was ever out of line and grade. The feature was critical for the crossing below the railroad tracks, which could not be shut down if problems occurred. The SBU-RC is currently manufactured in the 36-inch (900 mm) diameter range, but could be designed as small as 30 inches (750 mm). The machine operates much like a Motorized SBU (SBU-M) with a circular cutterhead and cutting tools that can excavate hard rock or mixed ground conditions. An in-shield drive motor provides torque to the cutterhead, while a pipe jacking system or Auger Boring Machine (ABM) provides thrust. Clever explains the biggest differences: “There is no manned entry. It eliminates the human element, so it is safer and there is no need for ventilation and other things required when you have a worker in the tunnel. With its guidance system, it also eliminates much of the risk on line-and-grade-critical bores.” Muck removal is accomplished via a vacuum system connected to a vacuum truck. The machine is capable of excavating hard rock and mixed ground crossings up to 500 feet (150 m) long, depending on conditions. While microtunnelling machines have been used on jobs such as these, Clever cites key advantages for the SBU-RC: “There is no slurry to mix or contend with. With MTBMs the slurry must be cleaned, pumped, and treated. With the SBU-RC there is a clean and dry pit, with no spoils to remove. The way the SBU-RC operates is much more cost-effective. The SBU-RC is also available for lease; MTBMs are often not cost-effective to lease for contractors trying to stay competitive.” The SBU-RC was delivered on April 14, and was lowered into a launch pit 26 feet (8 m) deep. There were several early tweaks to the setup including a larger vacuum truck that improved suction, and some modifications to the cutterhead including grill bars. These modifications were expected and will be incorporated into later versions of the machine. The machine began boring in volcanic basalt rock that was full of fissures, fractures and rubble pockets between 5,000 and 7,000 psi (34 to 48 MPa) unconfined compressive strength (UCS). While the start-up was rough going, crews quickly began getting rates of 20 feet (6 m) per day. “As we got used to the machine we went up to 40 feet (12 m), and one day we even got 50 feet (15 m). We were able to cut off a couple weeks of our schedule time. Taylor NW was very pleased about it. When you look down the pipe now after it’s finished, it looks like a rifle barrel. There is no sag, it’s all in one straight line,” said Stadeli. The early completion by the SBU-RC delighted the City of Bend and all those involved. “I think the SBU-RC is an exciting piece of equipment that has been compressed into a 36-inch size. To make it all work it is very compact. It’s impressive that the components have been sized down and it still works so efficiently,” said Stadeli. The Robbins Remote Controlled Small Boring Unit (SBU-RC) is capable of excavating small diameter hard rock tunnels at long distances, on line and grade. Controlled Small Boring Unit (SBU-RC) is a new type of boring machine capable of excavating small diameter hard rock tunnels at long distances, on line and grade.